What is the most overlooked red wine from Burgundy’s Côte d’Or? That’s a no-brainer in my book; it simply has to be red Chassagne-Montrachet. Mention the name to almost anybody outside the immediate region and they will start licking their chops in anticipation of glorious white wines, with nary a thought of reds. It is the ‘Montrachet’ in the name that does it. That famed vineyard straddles the border between Chassagne and the neighbouring village of Puligny, divided almost equally between the two. Thus when the villages of the Côte d’Or started appending the names of their most famous vineyards to the village names, in an effort to raise their profile, Chassagne and Puligny both laid claim to Montrachet. It produces the most storied dry white wine on the planet, casting a long shadow in the process and cementing the assumption that any wine with the name ‘Montrachet’ in it is, by definition, white. 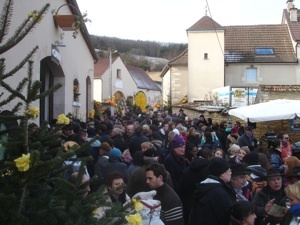 Party time outside Domaine Ramonet during last year’s Saint Vincent Tournante. What to expect in red Chassagne? An arresting, raw rasp of cherry fruit is its most usual signature. ‘Rustic’ is a term that is sometimes applied and ‘finesse’ and ‘elegance’ don’t usually crop up in my tasting notes. But if you want something immediately likeable and notably expressive then look no further.